There are no easy answers. But at least there’s an easy way to share the answers you have. Use the RICOH® MP 2555/ MP 3055/MP 3555 to simplify everyday office tasks and move information to the people who need it most, in the format they prefer. Print and copy important business-class presentations and proposals and choose between multiple internal and external finishers for a professional, polished look. 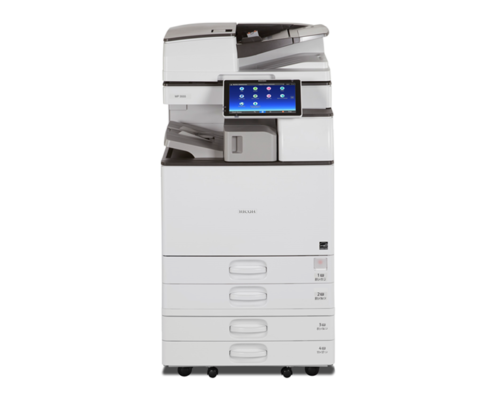 Scan full-color images, brochures and other forms and distribute them instantly. With the same pinch-and-flick and scrolling gestures you use on your smartphone or tablet, you can access critical information, set shortcuts and distribute information from the advanced 10.1″-wide Super VGA Smart Operation Panel. Or, connect remotely and work on the go. Take advantage of advanced security controls to help protect your data wherever it goes, from wherever you are.